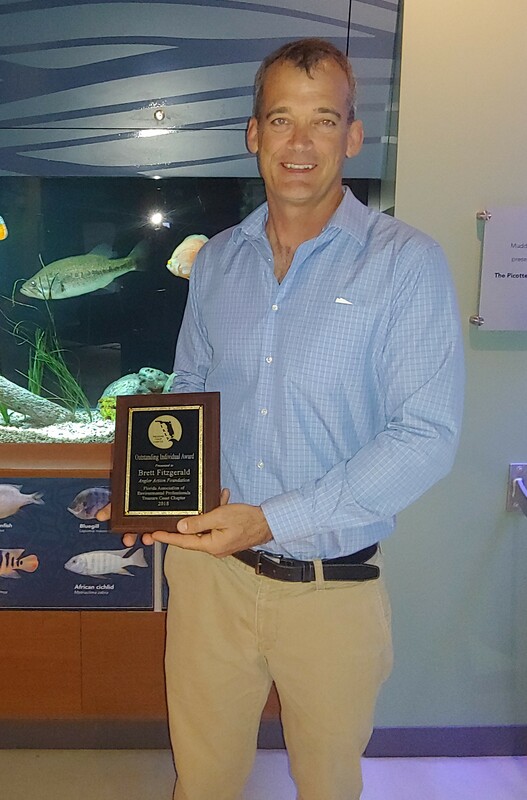 Years of hard, many times thankless, work was rewarded Thursday night during the Florida Association of Environmental Professional’s (FAEP) Treasure Coast Chapter awards dinner at the South Florida Science Center and Aquarium. Angler Action Foundation Executive Director Brett Fitzgerald was named as the organization’s Outstanding Individual. The honor is given to an environmental professional who demonstrates superior accomplishments and milestones in relation to the duration of professional years within the Treasure Coast region and who embodies the spirit and ethics of an environmental professional; enthusiasm, engagement, passion, and drive. Brett has been a part of the Snook Foundation/Angler Action Foundation for the past 13 years. He began as a board member in 2006 before leaving that position to take over the volunteer Executive Director position in 2010. During the past eight years, Brett has worked as a combination of unpaid/very underpaid Executive Director, all the while maintaining his job as a speech therapist in Palm Beach County Schools. The past eight years have been a grind that have included 80-hour weeks, hundreds of plane trips, thousands of meetings, hundreds of thousands of miles on his car and one message: You Are An Important Part of This Process. It’s what he has told virtually every fishing club in Florida. It’s what he tells recreational anglers, potential funders and anyone else that will listen. His goal upon taking over the position of executive director was to give recreational anglers a voice on the governmental level. He has succeeded. Under Brett’s supervision, recreational anglers around the country have found their voice. He worked with an app developer (Elemental Methods Inc.) to create the iAngler app, where anglers can log fish in on their phone, providing valuable data about fish stocks and habitats. Brett furthered that by creating an iAngler Tournament app, which now hosts anywhere from 10 to 30 tournaments across the nation each weekend, bringing even more data to the Angler Action Foundation. His doggedness has led to the opening of fishing seasons that had been closed to recreational anglers. His creativity has made the Angler Action Foundation a nationally-known entity and the singular voice for recreational angler data collection. Looking into the future, Brett’s vision will have a substantial impact on not only anglers, but anyone who lives near or plays on the water, from the Gulf Coast up the Atlantic Seaboard and beyond. Under Brett Fitzgerald’s direction, the Snook Foundation has grown substantially from an organization which primarily served Florida anglers and focused on statewide marine habitats to a group that now partners with enough environmental organizations nationwide that it precipitated a rebrand to the Angler Action Foundation.